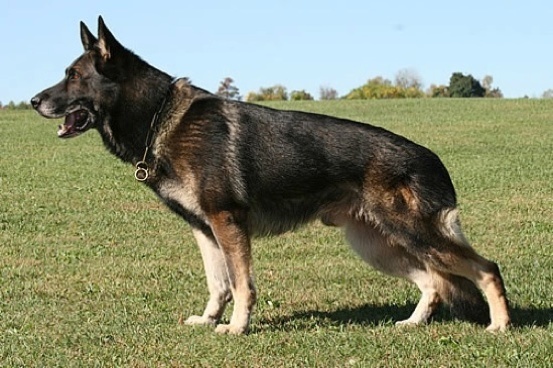 Beautifully refined and elegant, BB is a very feminine example of the German Shepherd Dog. Descending from strong working pedigrees on both her sire and dam lines, BB presents with very high ball drive and an intense desire to please. Trainablity, good nerve, and sound constitution, make her an excellent working prospect as well as an outstanding family member. She is hard to fault in temperament and turns inside out for children and guests. Pick up a ball and she is solely yours until further notice. She has consistently passed this temperament and drive to her pups and is an excellent momma...she will happily welcome you to visit her whelping box. Needless to say, BB is a very special dog and friend. It is an honor and privilege to work with her and her pups, and we are proud to offer them to you.